Some times when conducting historical analysis a small sample set can tell you that the market is doing something extraordinary. Indicators reaching excessive readings often suggest an edge because when things get too extreme, mean reversion tendencies tend to kick in. There are other instances where a small sample set simply suggests the market is not acting as it should. Monday’s action may be a good example of this. Gains of 3% - 4% that occurred on Friday were given up Monday in all indices on an intraday basis and most on an end of day basis. The S&P 500 rallied over 4% on Friday. 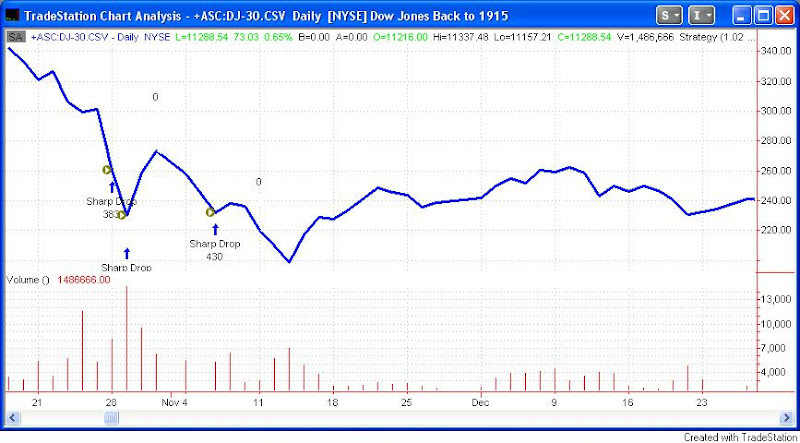 After dipping below Thursday’s close late in the day Monday, it barely closed above it. I ran a test to find other times since 1975 that the market had gained at least 4% one day and then printed a low below the close of 2 days ago. I loosened the requirements to 3.5%. Still nothing. 2.5%? Yes – two instances. Even at 2% there have only been 6 instances in the last 33 years where the market has given back all its prior day gains. Now, in case you interested, all six of these did bounce above the selloff day’s close within 2 days. In fact, 5 of them managed to bounce the next day. The bounces did tend to die out after day 3. So perhaps there’s a small upside edge based on this study, but that’s not the real takeaway. What’s significant here is that the market is acting in a way that it shouldn’t. It especially shouldn’t if it is planning on launching a great bull move. 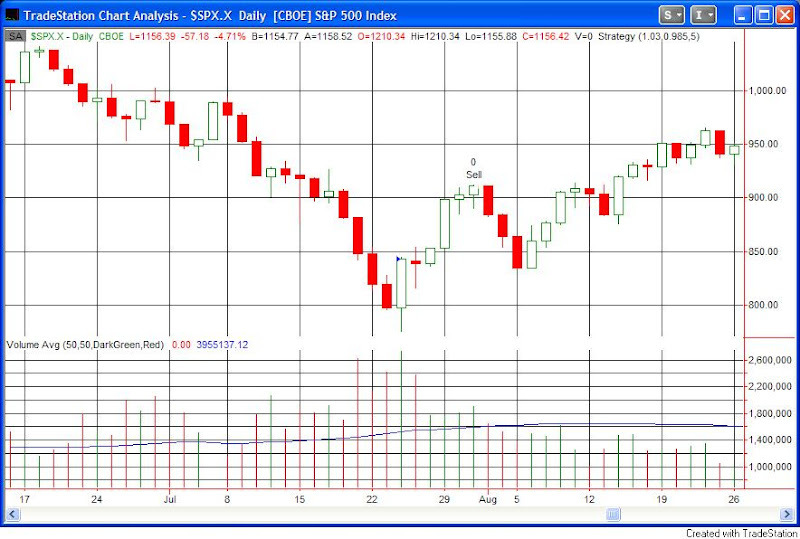 Look at some of the charts I’ve posted in the blog the last few days. Look at periods like March ‘03, July & October ’02, September ’01, September & October ’98, November ’97 and any other bottom you find. Massive one-day gains coming off lows simply don’t get wiped out the next day. It doesn’t happen. It happened Monday. I would consider Monday’s action a warning sign. That’s 12% from just the short side in a little over 3 weeks. All based on an incredibly simple system. Playing the chop has been working. 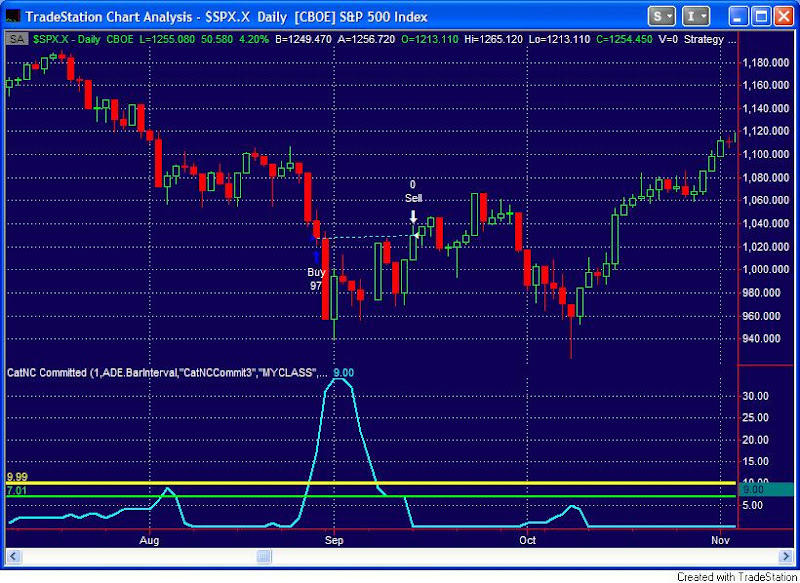 Monday’s action suggests that despite last week’s bottom attempt, this hasn’t yet changed. After gapping down Tuesday morning the market put in a sizable rally. The S&P gained over 4% from open to close. I looked back at other times the SPY gapped lower and then gained over 3.5% from open to close. The low number of instances means this is more “interesting” than “significant”. 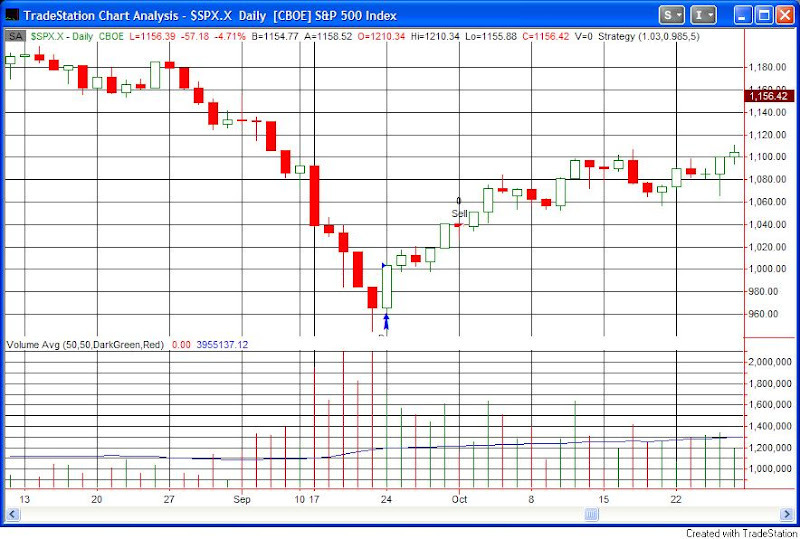 The pattern was fairly consistent as 5 of the 6 closed below the entry point within the next week before launching higher. The six instances occurred on 10/28/97, 10/15/98, 1/3/01, 7/24/02, 3/17/03, and 1/23/08. Some significant bottoms in that mix. 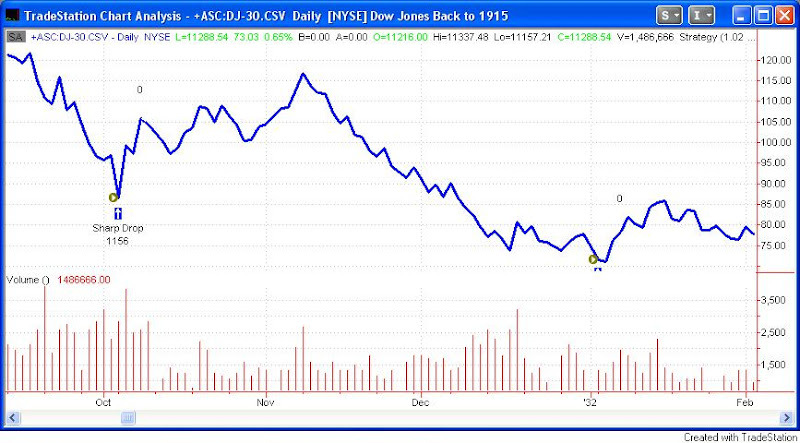 The only instance that didn’t pull back within the next week was 10/15/98. Just a quick post tonight, although I may have more to say tomorrow. 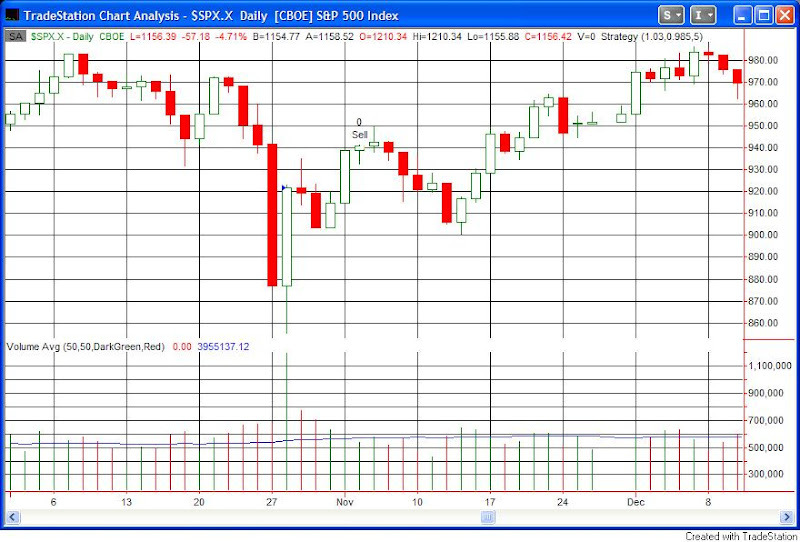 On Thursday the S&P made a 20-day low before reversing and closing strongly higher. We've seen this setup before. It was one of the 1st studies I posted to the blog last January. Read the post here. 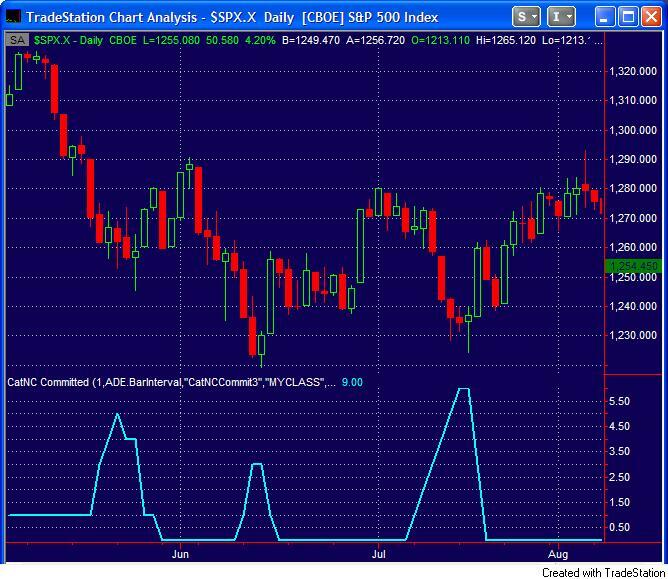 Normally, volatile trading like we’ve seen recently leads to some solid trading edges. Not the case so far this week. I’m having a hard time uncovering anything terribly compelling. When considering indicators, those that measure fear or capitulation are simply not registering the kind of extremes seen around market bottoms. The VIX has moved higher but it hasn’t spiked in a substantial way. The VIX:VXV ratio just poked above 1 for the first time in a while on Tuesday. Ratios of 1.1 or higher have more often been seen near bottoms. New lows have risen but are not even close to the levels seen in July. The CBI is at a paltry 3. The McClellan Oscillator is not near overdone. The percent of stocks trading above their 40-day moving average is over 40%. 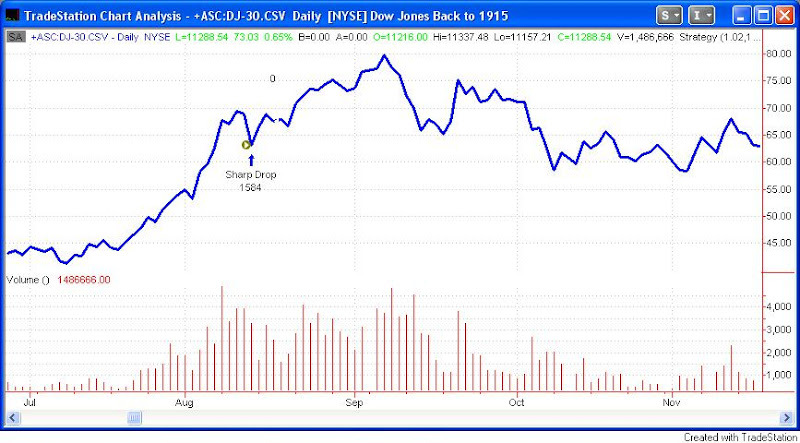 Near the July bottom it dipped below 10%. Of course most indices are still North of the July bottom. Therefore, you would expect the breadth, fear, and capitulation indicators to be less extreme than in July. Still, without evidence of a washout in progress, I have little inclination to step in front of this market and start buying. The price action isn’t providing much in that way of clues either. Much of what I’m seeing is nearly unprecedented. 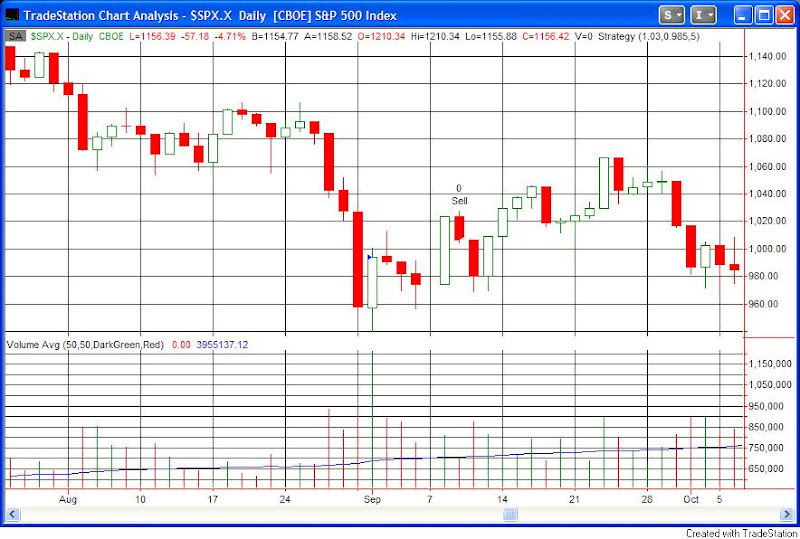 I looked for other times the S&P made 2% in one day and then saw those gains completely wiped out the next. It’s only happened twice before: 3/24/03 and 6/6/08. If I loosen the requirement to a 1.5% rise, then there are 16 occurrences. Unfortunately, trading after these instances was mixed and choppy with little discernable edge. I also looked at performance following drops of 3% or more in the S&P. Again, mixed results. The NDX action continues to be notable. 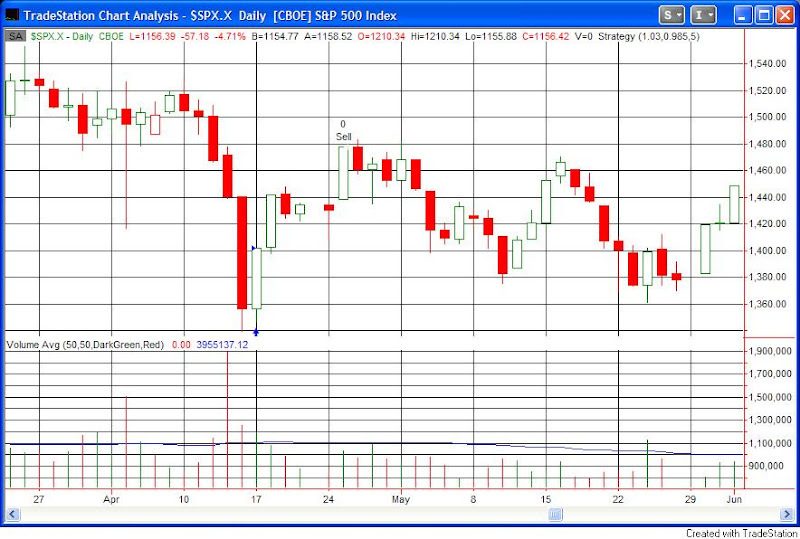 Today marked the 6th day in a row the Nasdaq 100 has closed below its lower Bollinger Band. Unfortunately, there is little precedent here as well. There have only been 3 occurrences since its inception in 1986. They were 12/18/89, 3/31/94, and 5/18/06. Certainly it’s overdue for a bounce but I’m not terribly excited about buying into it at this point. Last Thursday I showed an incredibly simple system with outstanding performance over the last 15 months. It basically sold short any time there were 2 up days and looked to exit at the 1st profitable close on or before day 4 – at which time it would exit no matter what. Incidentally, today’s drop would’ve been yet another winner for the system. 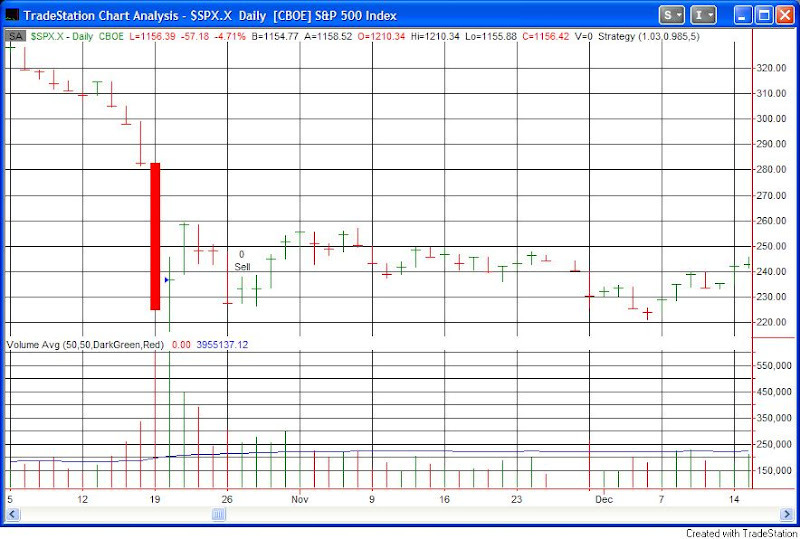 1) The S&P closes lower two days in a row - buy on close. 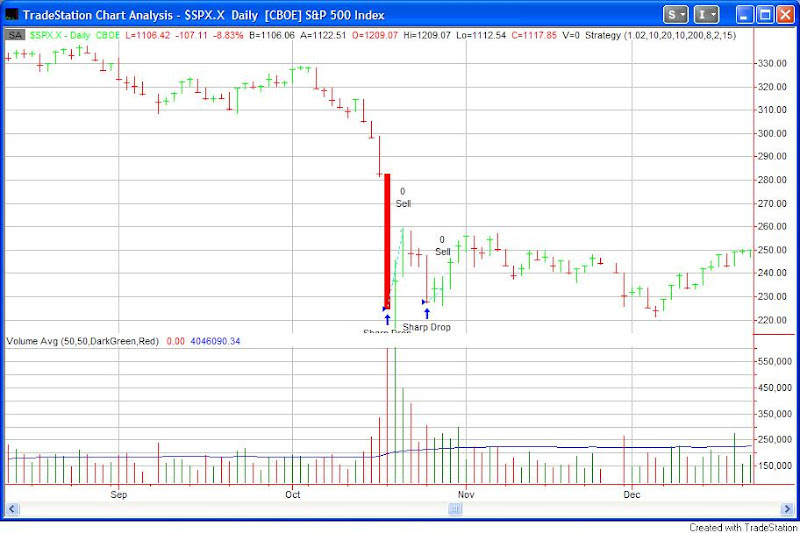 1) If the S&P closes above the entry price of the trade, sell on close. 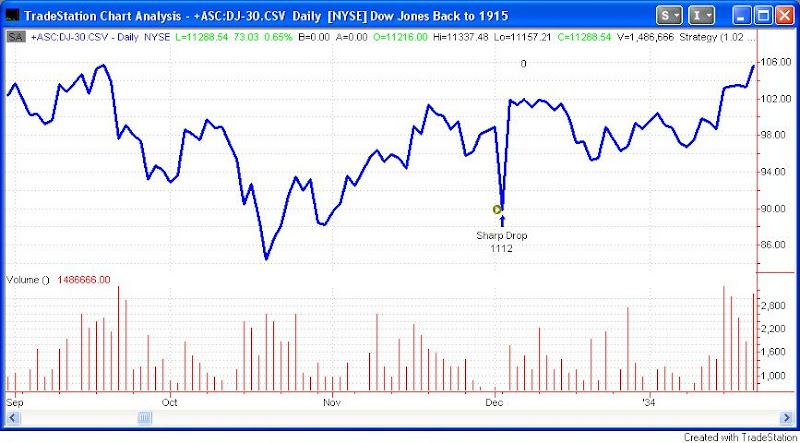 2) Sell on the close of day 3 regardless of profitability. Once again I should note that this system is a product of the environment and not a well-designed trading system. Entry and exit techniques are too raw for actual decision making. That said, results were fairly impressive. There have now been 16 winners in a row going back to February and the market has seen a difficult time during that period. Now that we've had two down days it's likely a poor time to try and jump to the short-side. Those that are already short may want to consider taking profits. Traders could also begin thinking long in the next day or so.